I’m a little behind in this week’s project, because it took several tries to find just the right pattern. For the fierce and sometimes violent Egyptian goddess Sekhmet, I wanted to include a lovely brown bugle beads in a collar, along with vibrant red vintage white hearts. Things just didn’t go as planned. As you can see from the mess, I’ve still got one failed attempt to undo. At first I wanted to incorporate the bugles into the main netting, but they take up so much room that the nets were a lot wider than I would have liked. Scratch that, and I discovered they looked really great as fringe. Unfortunately, something was still off. The white hearts were a little too vibrant. Against the cream and brown, they had a tomato hue, and made everything clash - not to mention that they didn’t give the impression of Ra’s pomegranate and ochre ‘blood’ potion from Sekhmet’s legend. I switched the white hearts out for some transparent garnet 8/o’s, and then everything fell into place. Last week's magatama collar is complete, but I've been so rushed this week with assorted things that I haven't had time to photograph it yet. Schedules are going to continue to be squeezed over the next few weeks, and it looks like this year's challenge is going to run overtime, though I am determined to finish and get started on a brand new approach! For 2014's theme, there will be lots more room for bracelets. I'm eager to work on some inspired cuffs! Happy Thanksgiving to all of my American readers, wherever you may be! I’ve been saving this month’s jewelry and fashion collage for today - the colors of a fall dinner table are just too beautiful to resist. Gourds and pumpkins are especially charming, with warm, muted shades of green, yellow, orange and brown. I started this collage with a beautiful multistrand necklace is the soft yellow of creamed corn. After that it was just a matter of finding some beautiful fall colors like pea green and russet brown. Naturally, knits and long sleeves were ideal for late fall outfits. I couldn’t resist a generous helping of leaves as well. Both outfits feature very different approaches to leaf earrings, each with their own appeal. I love the color and silhouette shape of the orange filigree, and the natural look of brass dangles. Which one is your favorite? Multistrand Seed Bead Necklace or Bracelet Project from How Did You Make This? Are you enjoying the fall colors right now? What combinations are your favorite? Things are finally getting back to normal in my workspace after a great craft show weekend. This means that tons of new ideas are piling up, while fresh designs are slowly making their way into my shops. I finished my latest Egyptian Gods piece just in time for the show, and although I didn’t get to see it find its owner yet, I’m happy to be able to share it now. I’ve created several chevron lariats throughout this year’s challenge, each with their own unique variations. One thing that tied them all together was the presence of blues. It was very refreshing to try the design out on a totally new color palette, with some interesting accents as well. For Set, the god of chaos and barren deserts, I started with a simple black chevron chain, with accents of opaque pepper red. Red is Set’s color, but I didn’t want to overdo it. I had already decided on using some African Christmas beads in the fringe, and a neutral background was just the thing to bring out all the colors and lovely stripes. I ended up pushing back a design for the sun god Ra in order to get this lariat finished in time, and I’ve decided to put it off yet again. I’ll be moving through some of the other gods first, and saving Ra for the end of the challenge. I already have a design in mind, and as it’s going to be a big one, I think it will make a great finale. The winner of last week’s winter bead giveaway is Linda - congratulations, and thank you so much to everyone who entered! This month, I asked about your favorite holiday color palettes, and as always the results were varied and full of inspiration. Linda’s picks were sparkly white with sky blues and the greens of a winter forest. With these color inspirations in mind, I set out in search of some pretty winter inspirations. The bead and jewelry picks especially put me in the mood for snow! Frosted glass and soft mossy greens do make a gorgeous combination - and one that is easily achieved with beads. May all of your holiday projects be full of cheer! Yesterday morning all of the puddles in the neighborhood were frozen solid - winter has arrived. I suppose that means it’s time to start thinking about festive bead colors and holiday jewelry designs. Although I love a good red and green combination as much as anyone, I often find myself drawn to the more elegant and fancy holiday palettes, like burgundy and frost, gold and emerald, or plum and cobalt. This month’s bead picks include two new favorites, and some beads that I’ve been neglecting lately due to so many other ideas and designs vying for my attention. First we have a lovely bunch of shiny, gold dyed freshwater pearls. I love the organic shapes - not only are these slightly imperfect pearls very affordable, but they have a primitive quality that I adore for ancient inspired designs. Although I’ve added a lot more pearl and shell to my stash this year than I usually do, I couldn’t resist snapping these ones up. I’ve been so busy with Egyptian Gods and craft fair goodies these past few months, I keep forgetting that I’ve been eager to make ladder cuffs using my new selections of Czech bugles from Shipwreck Beads. These opaque white bugles are perfect for Egyptian and tribal pieces, but would make for lovely frost and ice designs in winter as well. I’m looking forward to seeing what they can do. Finally, I have some transparent cobalt 8/o seed beads that I can hear calling to me daily. I recently started keeping a list of bead styles and colors that I wish for when designing pieces, so that I can remember to add them to my purchases and bead shopping time. I don’t know how I ever got by without one of my favorite colors in this size, but it’s been remedied thanks to these beauties from Fire Mountain Gems. The large boxes that Dyna-Mites come in are a little too big to fit in my usual storage bins, so they’ll soon be heading for some baggies. 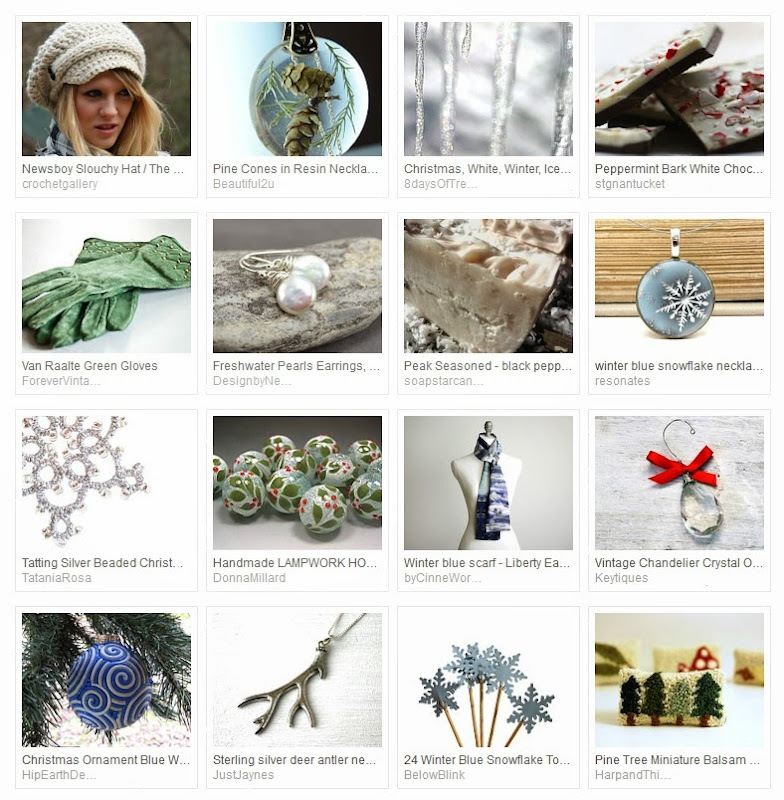 Do you have a new favorite bead to work with this winter? 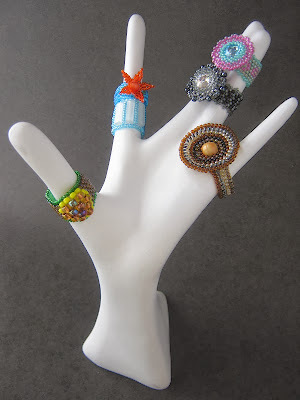 Last week I had planned to share the final rings that I was making to take with me to the craft fair, along with a promise that it would be the last ring update. Unfortunately, I was so busy preparing the rest of my inventory that I never got the chance. Now that the fair is over, things are back to normal on the drawing board and the bead tray. This week, I’m just finishing up a piece that I started during the show. I brought along a few favorite bead colors and enough thread to start a project or two, to keep me busy during slow periods. On the second day, I nearly finished a pretty new collar with opaque blue and green seed beads and lovely little 8/o magatamas in transparent lime. The new chevron lariat that I was working on for Set turned out great! It took some time to find just the right accent sizes, and I ended up with some additional colors like blue and green. Still, the Christmas beads added just the right amount of personality. My favorite part of the design is the colorblocked fringe. I find myself returning to this style more and more often since Apep, and loving the results. One of the great things about being crafty is having the ability to adapt when things go awry, or to find creative solutions to problems like tricky storage or broken tools. Why buy something new when you can fix it yourself? A while back one of my favorite jewelry displays took a tragic fall and broke into several pieces. The polystyrene hand that I had been using for ring photographs lost a finger, making it just about useless. Luckily, it didn’t shatter into millions of pieces like porcelain or other materials might have. All it needed was a little glue. I first tried repairing it with what I had on hand - some Gem-Tac with tape to hold it together while it dried. Everything seemed fine at first, but after a day or two the pieces just came apart on their own. I really wanted to have this display intact for the craft fair, so I needed a different approach. After adding some E-6000 to my supplies for knotting projects, I had what I needed to do the repair right. Once the pieces were back together, the display still needed a makeover to cover up the cracks and leftover glue from the first mishap. At first I considered using decoupage with a layer of paint over top, but knew it would be both time consuming and too likely to go wrong. Although the texture might have been a nice effect, it was really an unnecessary step. Instead I gave the display 3 coats of paint to match my other displays - 2 out of 3 mirrors from a set I bought for the show. They made perfect bowls for displaying rings, while the largest mirror I saved for helping customers try out pieces that they liked. It’s great to have this piece back in action! 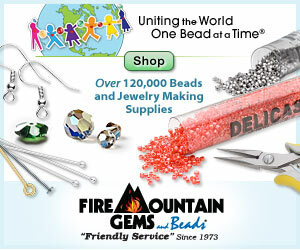 Have you rescued any beading tools or fixtures recently? How did it work out? Here on the West Coast, winter scenery is a little backwards. All summer long the grass gets baked to a golden brown, and then becomes lush and green again with the almost constant winter rain. This climate quirk has inspired me to try out some winter palettes with a more vibrant green than the deep velvet of holly leaves and pine needles. The perfect character to play this part are some beautiful carved bone tubes from Happy Mango Beads. The finish isn’t uniform, giving them an organic, mossy finish. The colors range from olive to chartreuse, with little white stars scored into the surface. First I paired the green bones with light and wintry blue, and shiny jet black for contrast. Although we miss the leaves when they’re gone, the look of branches in silhouette on a bright winter sky is a welcome one! The greens definitely have a coolness to them in this trio, like moss with a layer of frost. There’s a certain watery-ness to this palette, which I decided to call Frozen Creek. Of course I couldn’t resist trying out some bright opaque red. Adding white seemed a little too obvious, and probably wouldn’t have a very festive effect on the lighter greens. Instead, I tossed in a handful of gold Swarovski Elements pearls. Antique Centerpiece has a warm elegance, like a favorite decoration that gets passed on from one generation to the next. Finally, I wanted to try out a complementary palette, starting with lovely olive green seed beads. Transparent rootbeer brown provides a little light and some additional organic color for this palette. With so much green, this one could only be called November Lichen. Are you using your winter greens right now? Which shade do you prefer? Although fall is still technically here, once we’ve put away our pumpkins, it’s time to start thinking ahead to the delights of December. With snow and ornaments in mind, I’ve put together a pretty bead giveaway for you with pieces from my personal collection. First we have a handful of gorgeous vintage acrylic beads in translucent white and clear with frosty accents. The swirl beads are a personal favorite, and the carved pieces are perfect for holiday designs. Also included in the giveaway are some metallic gold acrylic cubes, and a wonderful strand of silver spacers from Kenya. What is your favorite winter color palette? Important: Comments must be made here on Inspirational Beading to qualify. Please make sure to include a contact method in your comment, or through your profile, so that I can get in touch with you if you win! Incomplete entries will not be included in the final draw. One lucky winner will be drawn on Wednesday, November 13th. This giveaway is open to readers in the US and Canada. 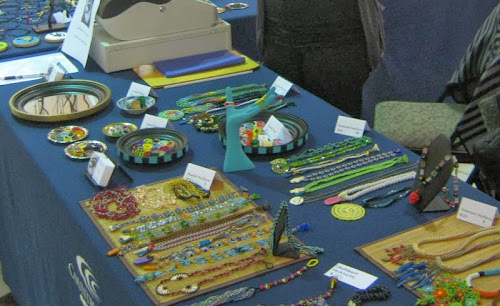 It seems like the closer I get to craft fair day, the less free time I have to bead. I lost a few days working on Halloween costumes (totally worth it), and one to falling asleep instead of staying up to bead (not really worth it). Even though things are now feeling really rushed, I’ve decided to go ahead and work on one more lariat for the collection, and hopefully I’ll have enough time to whip up a few more rings and pendants, too. This piece is inspired by the Egyptian god Set. It took awhile to decide on a palette and proportions, but I finally went with mostly black and red accents for the main beadwork. I’ve got some really great black and white bone beads for the fringe, along with a handful of bold and colorful African Christmas beads. No matter how informative, inspiring, or beautiful an instruction book is, there is no substitute for experience. Though a book can teach us how to do a technique, we must practice and repeat in order to master it. What makes Polymer Clay Color Inspirations a unique title is a focus on practicing concepts, rather than learning techniques. 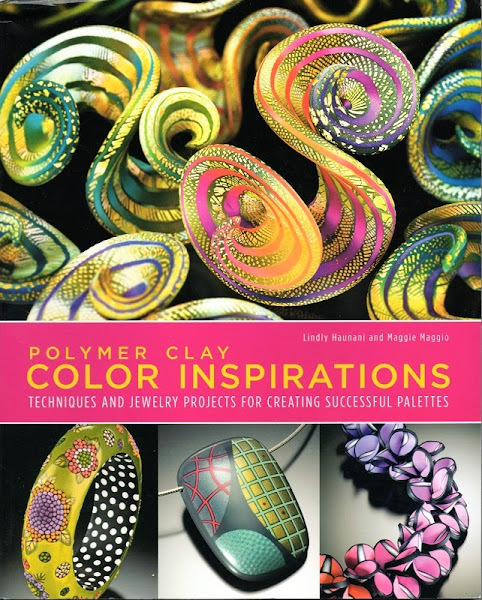 Lindly Haunani and Maggie Maggio have created a primer for working with polymer clay - the type of book that you should read through twice before buying your first brick of clay. Not only is it an incredibly valuable resource for the basics of color theory, but each chapter includes homework assignments designed to help readers absorb and understand the concepts. By making these polymer clay inspiration tools and practice projects, beginners can become familiar with color mixing, conditioning, and baking before starting on their first official design. The entire book is filled with gorgeous full color photographs of finished jewelry and sculpture that provide examples of the color ideas being discussed. The projects include helpful step photographs and tips to get the best results. Topics include: Polymer Clay Basics, Understanding the Properties of Color, Choosing Colors for a Project, Mixing Colors That Flow, Orchestrating Color Combinations, and Exploring Color Composition, just to name a few. Although many of the assignments include mixing and baking clay samples, the entire book is a useful color course for all artists and designers. The first project - making an inspiration collage - is an incredibly enlightening exercise in finding one’s go-to palette, and making it work in designs. At the back of the book, artists can find charts and scales to use when making color choices, and a handy resource guide. If you’re ever feeling like you’re in a color rut, or want to try out a totally new medium with bold color possibilities, Polymer Clay Color Inspirations will provide a lot of insight into the realm of mixing and combining color.